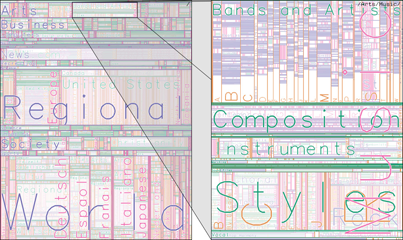 The treemap visualization technique is good at providing overviews of trees that have weights or sizes on the leaf nodes. But details are difficult to see when trees become large and deep, especially when the screen is small. With trees approaching the limit of a million items, the smallest details are not visible on a regular screen. For example, the figure below shows the hierarchical classification of web sites provided by the Open Directory Project (ODP). It consists of 694,986 categories distributed on 13 levels. The details of the Arts/Music category shown on the right are not visible on the full tree shown on the left. Tree displayed as a zoomable treemap. (right) zoomed view providing details on Arts/Music. To solve this problem, we introduce in [BL06] the concept of zoomable treemaps (ZTM). Because of their recursive nature, treemaps can be seen as multi-scale representations that inherently define multiple levels of details. ZTMs enhance classical treemaps by using the zoomable user interface (ZUI) paradigm to navigate efficiently in a hierarchical data space. Traditional ZUIs let users interact directly and continuously with the information space through panning and zooming. While this approach is quite natural, it requires much user interaction to allocate the maximum amount of available space to the nodes of interest. Many gestures are for instance needed to display efficiently the parent of a given node or one of its siblings with the “free flight” metaphor (by “efficiently” we mean that we want the new node to be entirely shown and to occupy most of the available space). We have designed a set of new multi-scale navigation techniques which make use of the specific structure ot treemaps to facilitate navigation in such representations. R. B. was funded by the Île-de-France Regional Council. A video showing the interaction techniques presented in the demo is available. ZTM code is available under the GPL-compatible free software CeCILL version 2 license. Renaud Blanch and Éric Lecolinet. Browsing Zoomable Treemaps: Structure-Aware Multi-Scale Navigation Techniques. In IEEE Transactions on Visualization and Computer Graphics 13(6), (Proceedings of IEEE InfoVis 2007), pages 1248-1253, 2007. Renaud Blanch and Éric Lecolinet. Treemaps Zoomables : Techniques d'Interaction Multi-Échelles pour les Treemaps. In Proceedings of IHM 2007 (to appear), Paris - France, November 2007. ACM International Conference Proceedings Series. Renaud Blanch and Éric Lecolinet. Navigation Techniques for Zoomable Treemaps. Reviewed demo in Conference Companion of UIST 2006, pages 49—50, Montreux - Switzerland, October 2006.